← Staten Island Semaphore Station / Optical Telegraph Signal Book: Just How Did They Communicate? Pictured above is an original, 1863 Battle of Gettysburg / Civil War subject CDV Photograph, which was sold to support those children orphaned by the Civil War. This fascinating CDV is titled “The Children of the Battle Field” and features a fantastic Albumen Photograph taken from the famous Ambrotype Photograph which was originally found clutched in the hands of an unidentified Union Soldier who died on the Battle Field at Gettysburg. 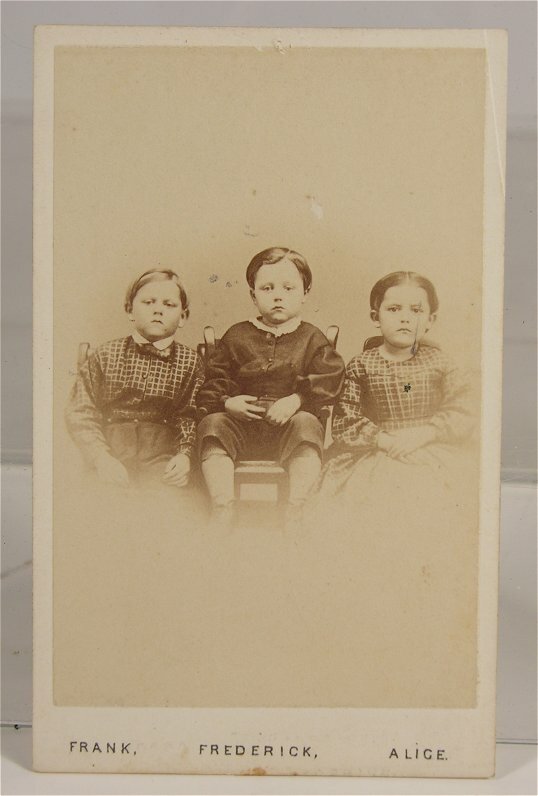 The three young children pictured here are identified in printed text on the card mount below the photo as “Frank. / Fredrick. / Alice.”. Printed text on the back of the mount reads: “The Children of the Battlefield. / This is a copy of the Ambrotype found in the hands of Sergeant Humiston of the 154th Regiment of New York Volunteers, as he lay dead on the Battle-Field of Gettysburg. 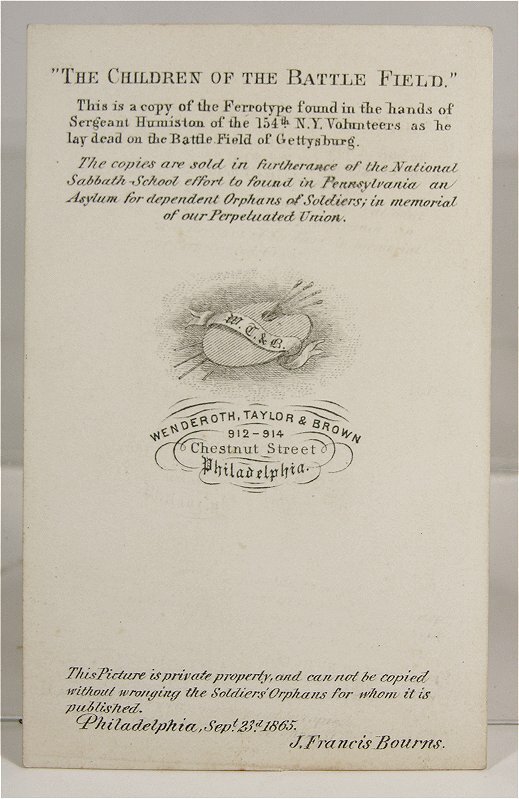 The copies are sold in furtherance of the national Sabbath School to found in Pennsylvania an Asylum for dependent Orphans of Soldiers in memorial of our Perpetuated Union”. Further text on the reverse reads “This Picture is private property and cannot be copied without wrongdoing the Soldier’s Orphans for whom it is published”. 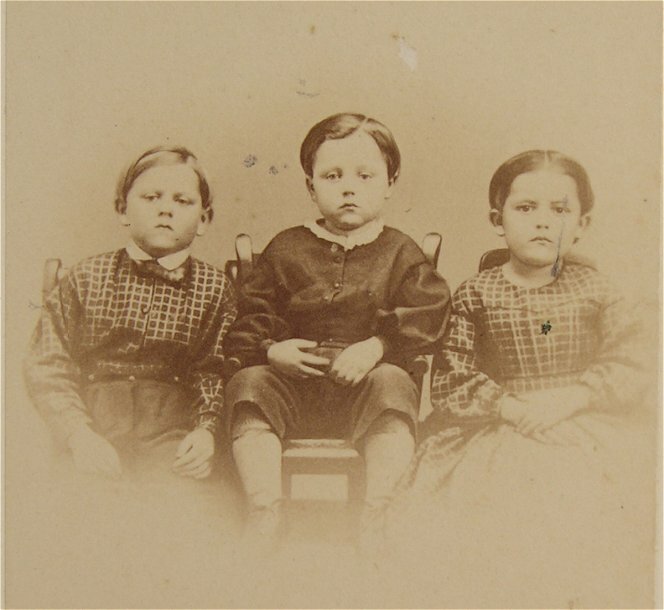 “Few readers of the public journals will fail to remember that, after the battle of Gettysburg, a dead soldier was found on the field, clasping in his hand an ambrotype of his three little children. No other incident of the present fratricidal war is known to have so touched the heart of the nation. For months after the battle, the soldier’s name, and the home of his family, were a mystery. The ambrotype found within his clasped hands was obtained by J. Francis Bourns, M.D., of Philadelphia, who had the picture photographed, in the hope that its circulation might lead to the discovery of the family, and the soldier’s own recognition, and, at the same time, that the sales of the copies might result in a fund for the support and education of the little ones thus left fatherless. Publicity was also given to the incident in many newspapers throughout the country. From various quarters letters of affecting inquiry were soon received; but still the mystery of the soldier was unsolved. At length, in the month of November, a letter arrived with the intelligence that a soldier’s wife at a little town on the Allegheny River, in Western New York, had seen the account of the picture in a religious paper, the American Presbyterian, of Philadelphia, – a single copy of which was taken in the place. She had sent her husband such a picture, and had not heard from him since the sanguinary struggle at Gettysburg. With trembling anxiety she awaited the reply and the coming of the picture. A copy of it came, and was the identical likeness of her own children, and told the painful story that she was a widow and her little ones were orphans. The unknown soldier was thus ascertained to be Amos Humiston, late of Portville, Cattaraugus county, New York, sergeant in the 154th N.Y. Volunteers.”. 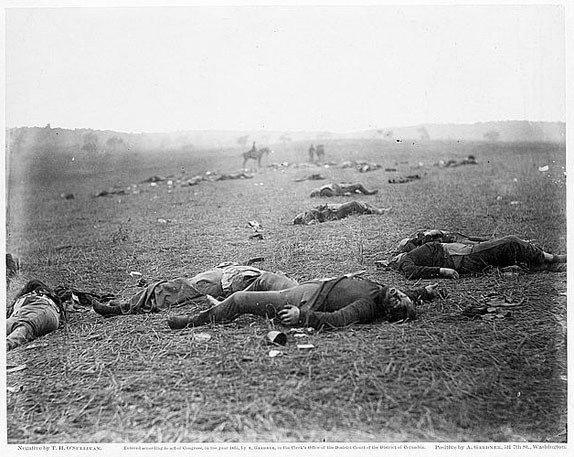 A glass plate showing the aftermath of The Battle of Gettysburg titled “A Harvest of Death.” This image was taken by Timothy H. O’Sullivan for Alexander Gardner circa July 5-6, 1863. It is courtesy of the Library of Congress. For more information, please see our eBay listing. This entry was posted in 19th Century, American Tragedies, Civil War, Gettysburg, Past Auction, Photography and tagged 19th century, american civil war, antique photographs, antique photography, civil war, civil war collectibles. Bookmark the permalink.